The Cause of Stomach Ulcers! "Quit stressing, and no eating spicy foods!" Is the old wives tale of the cause of stomach ulcers really a myth? Helicobacter pylori is a bacterium that lives in the mucous lining of the human stomach and has been found to be the main cause of these stomach (gastric) ulcers, duodenal ulcers, and even stomach cancer! About half of the world's population is infected with this Gram-negative, flagellated, helical shaped bacterium. DISCLAIMER- H. pylori is a relatively new bacteria, discovered in 1979. It was isolated and named by Robin Warren, and Barry J. Marshall in 1983. It is very difficult to culture and research is still being conducted on it. This website is dedicated to providing information about Helicobacter pylori. It is part of a compilation of informative websites focused on many other organisms, dreamed up by Dr. Tom Volk at the University of Wisconsin, La Crosse. This website was created by me, Evan Pluym. 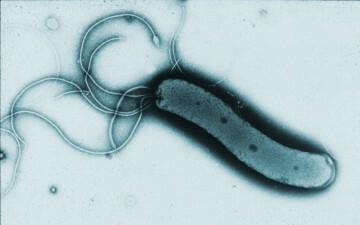 For classification information on H. pylori, click here.